Adaptive Natural Density Partitioning (AdNDP)  is a newly developed theoretical tool for obtaining patterns of chemical bonding in the systems of the most general type. AdNDP is based on the concept of the electron pair as the main element of chemical bonding models. Thus, it represents the electronic structure in terms of nc - 2e bonds. With n spanning the interval from one to the total amount of atoms in the particular atomic assembly, AdNDP recovers both Lewis bonding elements (1c-2e and 2c-2e objects, corresponding to the core electrons and lone pairs, and two-center two-electron bonds) and delocalized bonding elements, which are associated with the concepts of aromaticity and antiaromaticity. From this point of view, AdNDP achieves seamless description of systems featuring both localized and delocalized bonding without invoking the concept of resonance. Essentially, AdNDP is a very efficient and visual approach to the interpretation of the molecular orbital-based wave functions. In other words, the AdNDP is a method of description of the chemical bonding combining the compactness and intuitive simplicity of Lewis theory with the flexibility and generality of Canonical Molecular Orbital theory. The results of AdNDP analysis first appeared in our paper published in  as a source of deciphering σ-bonding framework of an "all-boron naphthalene" B162-. This dianion, though being π-aromatic analogue of a classic aromatic compound naphthalene, C10H8, was shown to form the island-aromatic bonding via AdNDP - formation of six aromatic σ- triangular subunits and two 4c-2e aromatic σ bonds within the globally antiaromatic cluster. Twelve 2c-2e B-B bonds are responsible for the peripheral bonding and holding eight aromatic subunits together. The AdNDP method has been applied to a series of all-boron clusters , CB62- and C2B5- clusters , a set of typical aromatic organic molecules (including cyclopropenyl cation, cyclopentadienyl anion, benzene, naphthalene, anthracene, phenanthrene, triphenylene, and coronene) , and golden clusters . The analysis of the chemical bonding in doubly antiaromatic B62- (D2h, 1Ag) dianion  is expected to lead to the formation of the island-aromatic bonding. The bonding picture obtained by AdNDP clearly supports the idea of formation of two doubly aromatic (σ- and π-) triangular subunits within the globally antiaromatic cluster. Six 2c-2e B-B bonds responsible for the peripheral bonding and holding two aromatic subunits together are also present in the picture. We showed in  why hexagonal structure of CB62- is higher in energy than isomers where the C atom located on the periphery. According to AdNDP analysis the hexagonal structure is doubly (σ- and π-) aromatic system (six delocalized σ electrons and six delocalized π electrons) with six peripheral 2c-2e B-B or B-C bonds. However, the central C atom of the hexagonal structure is involved in delocalized bonding only, which makes this structure unfavorable because more electronegative C atom rather makes classical 2c-2e bonds. Hence, the lower electronegativity of B compared to C results in "pushing out" C atom from the center of molecule. 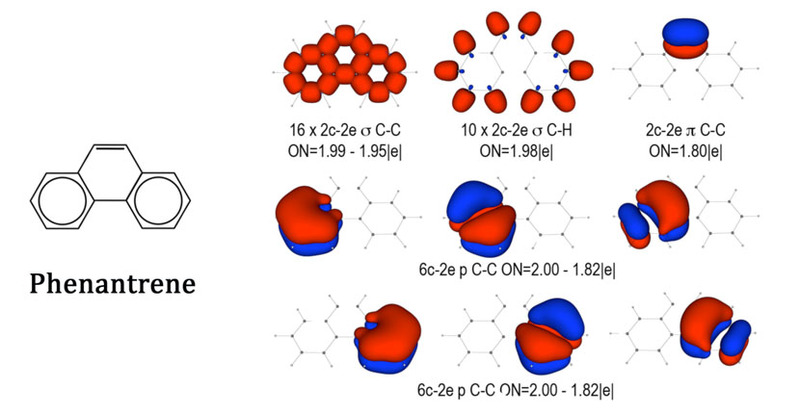 AdNDP analysis revealed that in the lowest-energy structure of CB62- C atom participates in two 2c-2e B-C bonds, one 3c-2e σ bond, one 4c-2e σ bond, and 4c-2e π bond. This structure is σ-aromatic (six delocalized σ electrons) and π-antiaromatic (four π electrons). The AdNDP analysis  for phenanthrene, C14H10 - a classic π-aromatic compound with 14 π electrons, revealed the bonding picture consistent with generally accepted Clar's structure and also consistent with NICS representation. The σ-bonding framework consists of 16 C-C σ bonds and 10 2c-2e C-H σ bonds. The π-bonding framework consists of one 2c-2e C-C π bond with contributions from the two upper carbon atoms of the central six-atomic ring and six 6c-2e C-C π bonds involving carbon atoms of the two peripheral six-atomic cyclic fragments. The pattern of chemical bonding in Au20 revealed by AdNDP  shows that twenty electrons form a four-center two-electron bond in each of ten tetrahedral cavities of the Au20 cluster. This chemical bonding picture can readily explain the tetrahedral structure of the Au20 cluster. Furthermore, we demonstrate that the recovered 4c-2e bonds corresponding to independent structural fragments of the cluster provide important information about chemically relevant fragmentation of the cluster of the Au20 cluster. This work was highlighted in Chemical & Engineering News, 2008, Vol. 86, N. 51, p. 34. The patterns of chemical bonding obtained by AdNDP are consistent with the chemical intuition and lead to the unique compact graphic formulas. The resulting bonding patterns avoid resonant description and are always consistent with the point symmetry of the molecule. AdNDP representation of aromatic systems seamlessly incorporates localized and delocalized bonding elements. We believe that the AdNDP method will be an important tool in rational design of novel materials with tailored properties, molecular electronics, nanocatalysts, and that it will procede the further growth of the efforts establishing structure/property relationships and providing means of prediction of novel systems.